My Plotting Process and a Giveaway! Do you have the full story already in mind or does it just come along as you write? I am not a writer and I wonder how many authors write – whether the intricately woven details are there before or during writing…? IMMEDIATELY, and I don’t mean that lightly, the ENTIRE series for my Virtues and Valor series came to mind. Immediately. I had the characters, their histories, what they looked like, how they talked, how they moved, what motivated them, and the plots to all seven of their books. One time, I was looking through the phone book for a last name, and planned to write a series. I found the name “Renkoff”. About six weeks later, I had three books written. (I’ll actually be releasing this series sometime in 2016). The hard part, for me, is taking this whole.giant.jumble.of.everything.together and unraveling it so that it makes sense and flows for the readers. Because, *I* know what happens and how it happens and how everyone feels while it’s happening and what the room looks like while it’s happening. I see it in my head, hear it in my ears, smell it in my nose, feel it in my heart. It’s all right there. So, what I do, is take a program I use that allows me to look at “note cards” on a “bulletin board” and very quickly type out the gist of the plot. These are in no way complete, but they are almost in order. I type really fast and just write a summary of everything like I see it. Then I go into each of those chapters and write, adding action, dialogue, setting, feelings, thoughts, etc., to that bare bones summary that I’ve typed out gets fleshed out and allows the reader to hear, see, smell, feel, and think the things I already know. It’s one of the reasons I’m able to write so fast, I think. Because it’s all right there. I don’t have to stop and figure it out. I just have to convey it to the reader, and through the grace of God, I have that ability. So, now that I’ve explained it as well as I’m able, I’d love to answer your questions about my writing process or plotting process. One commenter will win a paperback of the ENTIRE Virtues and Valor series, which will include the SURPRISE book #8, Valor’s Vigil, which releases on November 8th! Can he protect her without risking his own cover, or will he place his own life in danger to keep her safe? I know there’s a lot of creativity that goes into writing a book. With each character, how do you know what type of personality will fit? What do you take into consideration or what research do you do to make sure you nail each personality so that it’s believable to your audience? I’m kind of obsessive about my research. But, not as far as personality goes — just as far as elements in the story, careers, etc. I go to where my book is set and interview people in person so that I know that what I’m writing is real. As far as personalities, go, they just kind of appear with the story. I have a book that I quit writing halfway through because I didn’t like the main character. Then, when I re-wrote it, she was the same character! Apparently, that was who she should be. So, she stayed that way and through the book, her character grew and developed and by the end, I actually liked her a little more. Hallee, what fun to hear about your writing process and to know I’m not the only one who’s sometimes late with my Inspy blog post! I get idea flashes, too, but they’re not as complete as yours from the sounds of it–there’s a lot of pulling out my hair and procrastinating with house chores before I get into a groove and can cruise madly. What’s that bulletin board program you use? Scrivener! I love it. I’ve just been using it recently. Before that, I actually would actually use note cards. This is so much easier. Oh my word! Three books in six weeks…that’s impressive Hallee. Do you find the revision process moves a lot slower than the first draft? I have not had any problem learning Scrivener. I’ve fallen in love with it. The revision process is hard for me because I don’t necessarily see the holes in the story, because they’re complete in my mind. I have more than one editor for that purpose. It takes longer for me to edit a book than to write it. I go slower, reading it out loud, and kind of going it over and over again until I feel it’s complete. I enjoyed hearing you say you missed the seasons in Florida. I lived in Florida for a while, but missed the seasons from the Virginia, Maryland area. I’ve never heard any one else say that before. How long does the writing process take? Do you move to editing quickly, or go over the plot a few more times? I actually do about four sweeps through the entire book. I add the dialogue and action, then go back in and set the scene, then go back in and add thoughts and feelings. It takes a lot more time than the original plot setting. 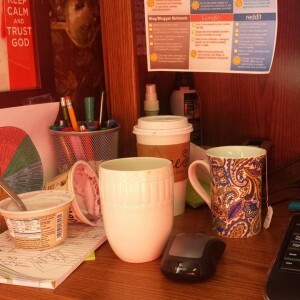 Hallee—I love this post–This is kind of how I work-and I just bought Scrivner. I’m excited to learn how to use it. Thanks for sharing your process. I love how you write fast. :) I’m an empty nester-I should write faster. Maybe I’ll try it! Scrivener is wonderful! Have fun learning it! Love the insight into your writing process. I have not read any of this series, yet; but it looks like one both my wife and I would really enjoy. Thank you! I hope you get a chance to read it. There’s for sharing your process with us. I can’t imagine what it would be like to have a whole book pop in your head. Wow! How exciting to see God use you like that. Do you use advance readers as proof readers? Or do you have professional editors who proof your work? Does your husband help you think out your books? Fun! Oops…..darn auto-correct! I meant to say… Thanks! I have a team of beta readers who read it AFTER it’s been professionally edited by two editors. My husband is my partner in writing. I honestly couldn’t do what I do without him. Great post! Do you design and create your covers? You are a new to me author and I look forward to reading your books! I am THE MOST non-visual person ever. I can’t even pick out paint for an empty room. I let other people do my covers and come to me when they’re done for the final approval. I bought an app for my iPad which was designed to coordinate with Scrivener called ‘Index Card’. It has the note cards on a bulletin card effect. 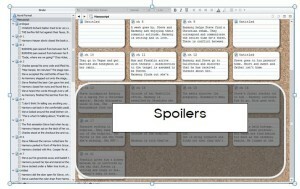 I don’t know how well it works as a helper for Scrivener but I love it to keep all kinds of notes for myself. I have ‘projects’ or bulletin boards on different topics where I can store notes from reading as well as separate bulletin boards for to-dos or trip plans etc. I have really enjoyed all of your books. I think I’ve read everything except the cookbooks. How is the writing and editing process for tour fiction books different from the process for non-fiction? Obviously the fiction is fiction and the cookbooks are not, but there is a creative process involved with both. This is so interesting! I’ve often wondered how that works. As you’re writing, do you ever find that you can’t write fast enough to capture all of the thoughts in your head? Do you ever feel as though you’re going to forget something vital to the story? Wow, how exciting to have the story pop into your head whole and complete! Some writers start the story and never finish because they get stuck. I like your method better! Now, if only I could incite my brain to work like yours! 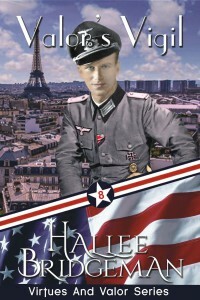 Have read a few of the Valor/Virtues books and can’t wait to complete the series. Interesting process, Hallee! I’m about the opposite. As I write, I feel like I am on a tightrope over a canyon at night. I cannot see where I am putting my feet until they feel the rope under them. I tend to write quickly… but not as quickly as you! Maybe because I can keep my balance on the tightrope better if I’m running instead of crawling. I discover the story as I go. It’s a fun process, but also a bit scary. Like a tightrope would be! Thanks for the interesting post, Hallee!! The way your stories/books just immediately come to your mind is nothing short of miraculous – God has blessed you with a huge writing talent!! Thanks for the giveaway opportunity. I loved you post. It must be awesome to see the whole story in your head. I have read many of your books and knowing this process makes them even better. Thanks for the wonderful stories you create and please keep doing it. I will be looking for more of your books. Hey Hallee…wow, what a wonderful post today!! I guess I never really think about what goes into the writing process for an author, so getting into the mind of one is interesting! I know each author has their own method (to their madness..haha), but to have the ENTIRE thing already there (plot, characters, background, etc) sounds kinda crazy to me :-) But I guess you’d have to be a bit crazy to be able to write, after all, you have to take on many lives and have them make sense for your readers! 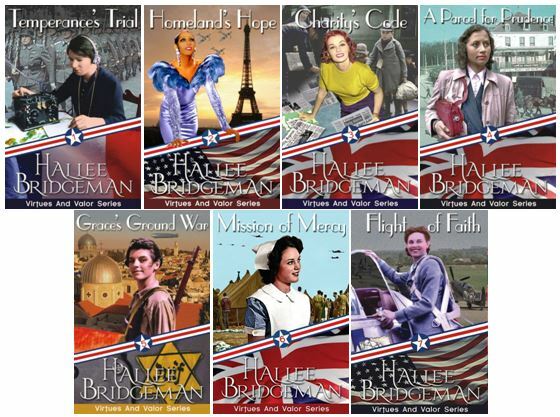 Thanks for the opportunity to win the entire Virtues & Valor series in paperback, very generous of you! Very interesting to read how you write. Haven’t read any of your books yet, but they sound interesting. I loved the first 7 books and I’m so excited you extended the series for Valor!!! So interesting to hear that you have the whole story in mind before you ever start writing. How long does it usually take you to write a chapter? Wow, it is a lot of work for writing a book. Thanks for sharing.